I discovered Hellboy series late, but he quickly became one of my favorites. The demon that forged his own path to be more than a prophecy, more than what light or dark chose for him to be…to be his own man. 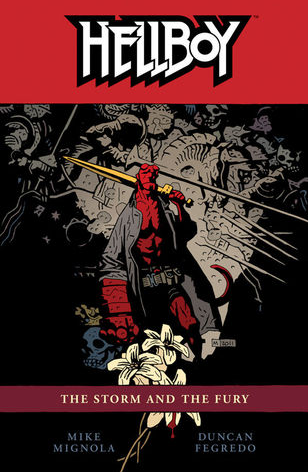 My word of advice before you start this collection, if you’ve only read volumes 10 and 11, both of which were just collections of Hellboy short stories, go back and read the previous volumes. You’ll want them to catch up to speed on who some of the characters are in this volume. And it is with sadness that I find this is the last volume in the original series of Hellboy (although don’t fear there will be further tales down the road.) It’s a wild ride to and unforgettable end. This is it. The end. The moment that Hellboy’s life has been building up to, to be a destroyer or savior of the world. Dead heroes are rising from their graves as the last battle is about to begin, and a lost king will rise to lead them. This has the potential to be the last fight for so many…Hellboy, the Elves, the Wild Kingdom and perhaps of humanity itself. Hellboy, like he so often has been, is in the thick of it and regardless of what the prophecies of light and dark say Hellboy will forge his own path till the very end. Like so many I have mixed feelings about this final collection. And I think in part because Mignola, like he’s always done, takes us down a path that we didn’t expect….and that many of us didn’t want. We want to see good to triumph over evil and good to survive. And that Hellboy, who has fought so many demons and monsters over the years, to get back up and keep on fighting. And instead we see Hellboy, seemingly subdued throughout the story. He rarely makes wisecracks, he drinks tea instead of alcohol, and it seems he’s uneasy instead of being sure of himself. Because Mignola has chosen instead to mimic real life. Our lives. Our own feelings on the page and we’re caught off guard by it. And that is what makes Mignola such a great storyteller and this such a great collection. There are also so many little aspects of the story that standout to me, the scenes with the dead rising from the grave, the mixing of mythology and that the strands woven since the beginning of the story weave together for one final time. And Hellboy. Even if he seems subdued his essence is there. He is his own person from the beginning to the end. As he has always done Hellboy has sought his own path, for better or for worse, he has no desire to be THE champion for light or dark, only what he can be and to follow his own code and own morals to the very end. The artwork in this collection once again is engaging and has hidden depths. The team of Duncan Fegredo and Dave Stewart do such a fantastic job of working together to create and color characters and scenes that are pitch perfect for the work. Together they’ve given Hellboy that one last ride, giving our hero his just due in making him seem bigger than life yet all too human. Fegredo brings his own style to the artwork, much more realistic that Mignola’s style, especially with the movement of the characters, but when he needs too he’s able to echo Mignola’s style perfectly such as the design of Niume’s champion. My favorite aspect of the artwork though is the movement of the characters and the cars that they travel in. It feels like they’re going to go right off the page. Even though the story at times feels uneasy, it’s the perfect ending. We get to see what happens and how Hellboy lived and concluded his life. We got to follow him, which is more than what we could or should have expected. And perhaps this is really just a pause in what is a great long tale. I don’t know about others, but I can’t wait to see where Mignola takes us with the “Hellboy in Hell” series that’s supposed to come out sometime this year.